When the four days of rain finally ended for Indianapolis Motor Speedway, the next form of nature was yet to make an appearance. It not only affected the underdogs of the Monster Energy NASCAR Cup Series but the XFINITY Series as well with a doubleheader being run mid-day in Indianapolis. That form of nature was the air and how drivers could use it to their advantage. The talk on pit road post-race in Indy was about the difficulty of passing after the opening few laps after a restart. Thankfully for the Cup guys, there were 10 cautions on the day, opening an opportunity for the small teams to not only stay closer to the leaders but stay on the lead lap. And after a busy news day for underdogs, there were a few who could use a good day to stabilize the rollercoaster week. For Matt DiBenedetto, the Go Fas Racing driver announced Friday that he will not return to the Ford team in 2019, pointing it out as a career decision toward a hopeful winning future in NASCAR. Additionally, an ailing Kasey Kahne would open the door for Regan Smith to make his 2018 debut for Leavine Family Racing. And for some, Monday’s event offered them a boost of confidence as the series kicks off its championship playoffs. Michael McDowell always wanted to run an Indianapolis 500. And though he never made it to the world’s top race, he did make it to the top of the Cup Series underdogs in the Brickyard 400. Being it’s only the second time McDowell has been the Frontstretch “Underdog of the Race” in 2018, Monday was a good day for Front Row Motorsports. Starting 26th based off points, McDowell was a mid-pack driver for the majority of the race, avoiding significant issues to maintain a top-20 spot. And when the race came down to multiple final restarts, McDowell picked off a few cars to earn 17th at the line. The result was his best-ever at Indy in his ninth start and his second straight top 20 in 2018. Behind him was one of the top two underdog stories of the week in Regan Smith. 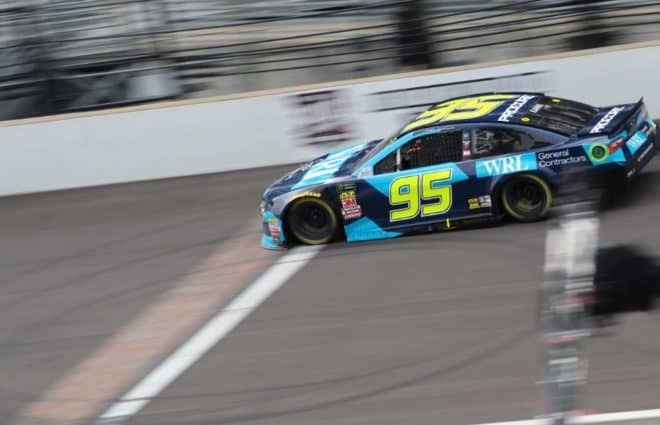 The driver who hadn’t started a Cup race in more than a year was once again tapped as a fill-in driver in aid of Kahne, who sat out Indy after complications from heat exhaustion in Darlington. Though the fill-in spot was compounded by zero on-track time, Smith drove the No. 95 LFR Chevrolet to a top 20 in 20th spot. The run was only his fourth top 20 since 2015 and gave LFR a good boost toward what is an uncertain future for both this year and next. Completing the top guys on Monday was Ty Dillon and Germain Racing. After starting back in 30th spot, the 2012 XFINITY winner at Indianapolis drove up to finish 21st for the third straight week in 2018. The No. 13 team hasn’t shown this type of consistency since May when they placed 13th, 28th, 20th and 15th in a four-race span from Texas to Talladega. Ragan was unable to match Front Row teammate McDowell in the top 20, instead, coming home 24th in his No. 38 Ford. Ragan was followed by a lengthy list of underdogs that stretched all the way back to 32nd place. Buescher was 25th after struggling to back up his 13th-place run at Darlington last weekend — JTG Daugherty Racing teammate Allmendinger crashed out early to finish 37th. Behind Buescher was Ross Chastain, who ran the doubleheader with XFINITY, a race where he finished 12th for JD Motorsports. Corey Lajoie had an encounter with the wall but stayed on track to finish 27th. Reed Sorenson, JJ Yeley and BJ McLeod completed the top 30. Thankfully for these drivers, they were able to leave Indiana with equipment in one pile. Unfortunately for Landon Cassill and Jeffrey Earnhardt, they likely have more than a dozen piles after a vicious crash took both cars out with 10 to go. With Earnhardt breaking loose in Turn 3, Cassill was running on his outside and was sandwiched between Earnhardt’s Gaunt Brothers Racing Toyota and the SAFER barrier. What ensued was a hard lick by Earnhardt, which sent his No. 96 airborne in the rear before landing back on all four tires. Cassill’s car stayed on the ground, taking a hard shunt on both sides of his No. 00 StarCom Racing chassis. The two were OK and finished 31st and 32nd, respectively. Timmy Hill brought his No. 66 MBM Toyota home in 35th while Matt DiBenedetto had a rear-end issue end his day 36th. Wallace suffered another brake failure in his No. 43 Richard Petty Motorsports Chevrolet and the break led to a crash with David Starr on lap 57. Both their days ended 38th and 39th, respectively. The XFINITY Series kicked off the doubleheader by running its Lilly Diabetes 250 on Monday morning. With the race having 100 laps up for grabs, drivers too had no practice time to gauge expectations. Also, the relatively new aero package that made its third appearance in 2018. Chastain was again the top XFINITY underdog, finishing 12th for JD Motorsports, but it wasn’t by much. Ryan Sieg was a close 13th in his family-owned No. 39 while Jeremy Clements was a step behind in 14th in his No. 51. Joey Gase, McLeod, Vinnie Miller and Starr all grabbed optimistic top 20s, making Monday a positive day for XFINITY’s underdogs.